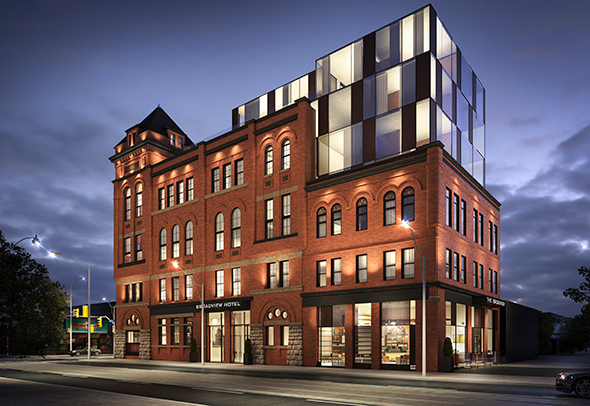 New details regarding the redevelopment of the Broadview Hotel have finally been announced. While the main opening of the building in still slated for 2017, a ceremony will be held October 5 at 7 p.m. to unveil the restored facade of the 125 year old hotel, which has been under hoarding for months as crews have worked on the masonry under the guidance of ERA Architects. The plan is to illuminate the building at night, so as to position it as the centrepiece of the neighbourhood. The west-facing facade has, in fact, already been exposed in the last few days, revealing a fresh-looking brick and a new logo for the building that reads B Hotel. The glass addition on the rear side of the building, which will host a rooftop bar with a view of the skyline, rose above the existing building in the spring and will be fascinating to see in the context of the completed facade. This looks like it will be a stunning place to drink. We've also learned today that the hotel element of the redevelopment will consist of 58 rooms, and that there will be a coffee shop and cocktail bar in the first floor lobby. There will be 4,000 square feet of event space when the hotel is finally operational. It's hard to glean a lot of concrete information about the restaurant component from today's new's release, but it's confirmed that area restaurateurs Erik Joyal and John Sinopoli (Escari Enoteca, Hi-Lo) are behind the menus. It will be located on the ground floor, and should help to animate the street corner. There's still a ways to go before the inside of this massive dual restoration/renovation project is revealed and we get a close look at the work of DesignAgency, but the early indications are that the interior design will be contemporary but with plenty of gestures to the building's history and the Toronto of old.